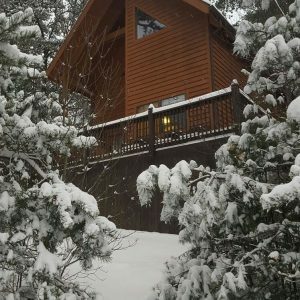 With the hectic pace of life, your cabin was just what we needed. It was so clean, well appointed, and peaceful and made for an amazing eight year wedding anniversary. We slept in the loft every night with the window open to take in the night air, the sounds of the woods, and the gentle patter of falling rain. We hadn’t slept that well in a LONG time! Your suggestions were great and we thoroughly enjoyed Grandfather Mountain, Linville Caverns and Falls, Mt. Mitchell, and many of the other stops along the Parkway. We spent the day at the Biltmore on our actual anniversary and completely agree with you, it is definitely a must see. Very impressive estate! As for eating, we have to give a BIG thumbs up to Knife and Fork in downtown Spruce Pine. The chef does a phenomenal job and uses ingredients from nearby farms. And with the menu changing daily, it makes for a destination in itself. And how great that it was so close to your cabin! We travel quite often and have to say, we have never encountered such great customer service. You truly care that each of your guests has an amazing time and are so quick to respond to questions and offer suggestions, even going so far as to just check in and say hello. Again, thanks for an amazing trip and helping us create Mountain Memories! We’ll be back! Loved this cabin on the Blue Ridge Parkway!